Kingshay costed herds have continued to show a slight decrease in average milk prices for February 2019 compared to February 2018 (29.11ppl compared to 29.46ppl last year). Milk yields were up 4% to average 27.7 litres pe r cow per day, however feed costs are still increasing, this month by 9% to 9.17ppl. February monthly margins per litre were down 5% to 19.94ppl and margins per cow down 8.9% to £137 per cow. This is mainly due to higher concentrate prices, which averaged £247/tonne, whereas February 2018 prices averaged £220/tonne. Milk yields have continued to increase this winter, as shown in the graph. 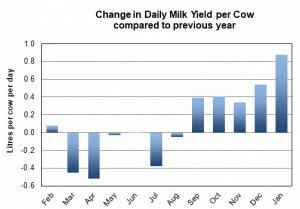 This graph highlights monthly changes to daily milk yields compared to the previous year. Each month from September 2018 daily milk is increasing compared to the previous year. Concentrate use was similar at 9.3kg per cow per day or 0.34kg/litre. Milk from forage was higher at 7.2 l/cow/day, reversing the recent trend as illustrated in the graph below. The rolling margins (MOPF) for the year ending February 2019 averaged 20.42ppl or £1,699 per cow. This was down slightly per cow compared to last year, due to higher feed costs, which were 12.2% higher. Concentrate prices averaged £237 per tonne. Average herd size decreased by 1 cow to 207 cows in herd. Yields averaged 26.325litres per cow/day, a 1% increase on last year. Milk from forage decreased by 6% to 7.66litres per cow/day. Cell Counts remained low at 161 (‘000), an increase on 158 (‘000). Milk price up by 0.03ppl to 28.81ppl. Purchased feed costs at 8.42ppl were 12.8% higher than last year, with concentrate prices averaging £215/tonne compared to £234/tonne. More in depth analysis of herds using Kingshay’s costings service can be found in Kingshay’s Dairy Costings Focus Report or call 01458 851555 for more details. If you are interested in analysing and comparing your herd’s figures with other similar herds, give us a call on 01458 851555. More details of this simple and easy-to-use service can be found HERE.